The night before my mother, Mary, died, she was packing for an impromptu trip to Caracas to visit her mother. My brother, Cesar, tried to talk her out of it. She should stay home where she was needed, he said. He even tried to call me to see if I could talk sense into her, but I wasn’t home and this was at a time when most folks still didn’t own a cell phone. Cesar kept trying to rationalize with her but it was to no avail. For my mother had a bee in her bonnet and nothing could dissuade her. She was a woman on a mission and the fact that her mother was long dead simply went over her head. 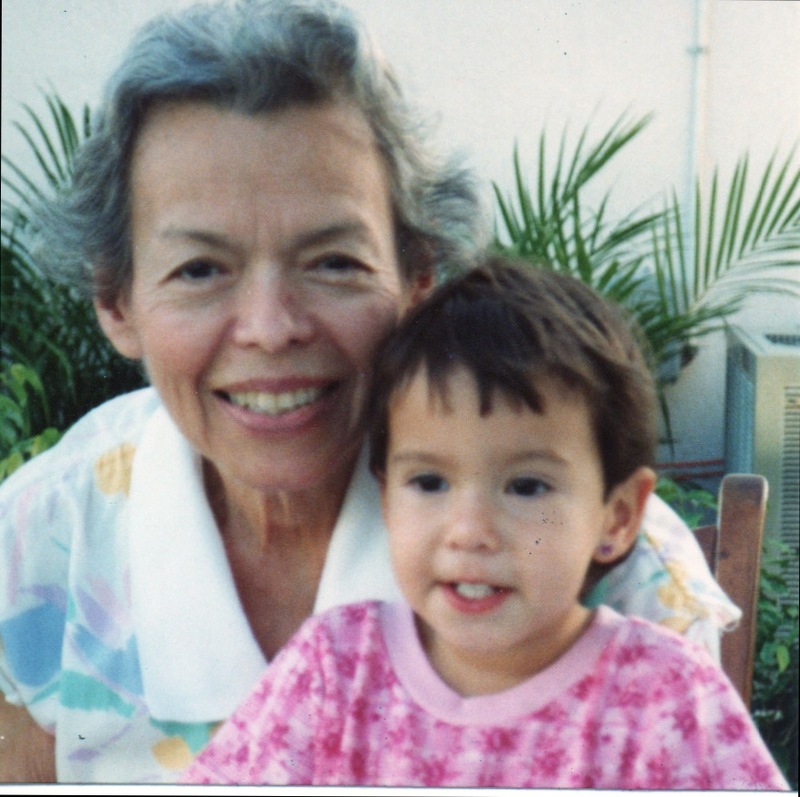 Florida, 1992: My mother poses with my daughter, despite not remembering that she is her granddaughter. 1) She was forgetful. Two years earlier, I’d gone to Florida with my daughter to visit my parents in their new home. My mother took one look at my 18-month old and asked me why I had brought this strange child with me. This, from the woman who cried with joy at the sight of her infant granddaughter, and who sat with me in the hospital hours after her birth. Startled, I had to think for a second. Random thoughts began to whirl in my head. Was my father dead? Who, then, was this impostor outside with my daughter? How did it come to this and where did my mother go? My mother, who never forgot a birthday and who always remembered to serve up my favorite dishes when I visited. Why couldn’t she see that the man she’d been married to for over 40 years was still alive—and just a few feet away? 2) She lost her bearings. After the move to Florida, my mother was no longer in the comfort of her Long Island home and all that had been familiar. She was instead like a planet spinning out of control, without the gravitational pull that had once kept her firmly connected to us. As far as she was concerned, Florida was alien turf and light years away from New York, where she had spent most of her life. She might as well be living on Mars. During our visit, I took my mother and my girl to a nearby playground. I strategically positioned my mother on a bench, where I could keep an eye on her while playing with my daughter on a jungle gym, just a few yards away. My mother seemed relaxed at first, like her old self and for a moment I could pretend there was nothing wrong. As long as she didn’t utter a word, she was the mother I remembered. But a second later, my child said something, causing me to look away. Then, I heard a cry, and just like that, my mother was in a state of panic, anxiously searching for a way out of the park and nearly in tears because she could not find one. I picked up my daughter, did my best to calm my mother, and quickly guided them both out of the park. I wondered whether we could ever have a normal outing again. 3) She was mean and disorganized. Naively, I thought I would help my mother organize her closet, which looked very helter-skelterish, if you ask me. But instead of helping, I made things worse. Her eyes bored into me as she vehemently admonished me for touching her things. Alarmed and slightly shaken, all I could think was, this is not my mother. My real mother clearly had been kidnapped, replaced by mysterious pod people, and was now starring in her own movie—“Invasion of the Body Snatchers.” Alzheimers, 3; Mary, 0. The disease was winning and gaining in on my mother. So the night that Mary tried to return to Venezuela to see her own mother, she packed her suitcase as best she could and went to bed. Perhaps exhausted from arguing with Cesar or frustrated that she wasn’t able to embark on her journey. Or maybe she just forgot she wanted to go. I don’t know. I wasn’t home when my brother called. It was Memorial Day weekend and I was out at a barbeque with friends. The next morning, my sister called with the news. Brain dead, she said, which to me sounded hopeful in some off-kilter way. Not completely dead, just brain dead. Later, it would fall on to us, her children, to pull the proverbial plug. My mother. Somehow I believe she knew the end was near. Which is why she spent the night before, packing her bags to see her mother. As for the autopsy report, it gave us the confirmation we needed: Alzheimer’s Disease. So glad I stumbled across this post — this was beautifully written. Thank you, so much! I’m glad you stumbled by, too! What a heartbreaking story. Yet told beautifully. I love your blog. Even though I have known you for years (is it decades yet?? ), I feel like I know you in a whole new way now. It makes me appreciate you in ways I never have before. So thank you for your stories… and for you. It’s a double gift! Gracias Monica. Su mama fue una mujer muy bella, tanto por dentro que por afuera. Y Ud., su hija, debe ser igual. Reciba mi pesame. Gracias, Ana Maria. Mi mama fue una persona muy querida, con un corazon enorme y un amor para su familia muy profundo. Jamas se me olvidara tanto que yo la queria. Es imprecionante ver una persona que uno quiere y con la que ha compartido toda su vida, en semejante estado de desorientación. Es muy dificil entender que en ese cuerpo está lo que conocimos como nuestras madre o nuestro padre. Simplemente uno llega a pensar que ya no existe o no es la misma persona. NOs hacemos desconocidos ante los más queridos y ellos se sienten tan desorientados de no saber quienes son ellos mismos y quienes son los que lo rodean. Siente que su vida se escapa y no saben porqué. Alguna vez alguien dijo que las personas con esa enfermedad no sufren, porque no recuerdan lo que eran y no extrañan lo que simplmente no conocen. El problema es para los que no sufrimos de la enfermedad, que si sabemos el pasado y el presente y queremos a gritos que nuestro ser querido vuelva a ser igual que antes. Que dificil te tocó con Mary. Ahora descanse en paz y no sepa mas de penas. My friend is going through the same thing with her father. The father who took her anywhere there were horses wasn’t the same man she was taking care of. She calls me in tears wondering how she can handle all this. Knowing her father, I feel her pain. It’ll be a tough, but relieving time when he passes. Watching someone who you love, who you’ve known all your life, deteriorate in this way is one of the saddest thing. In a way, my mother died long before she was officially pronounced dead. You watch them slip away from you, their personality gone, and there’s not a thing you can do to stop it. Like watching someone drown and not being able to reach them to save them. My biggest regret was not being home when my brother called. That was my last chance to talk to my mother, to hear her voice, even if she was angry and beligerent at the time. Perhaps I could have done something, said something to make her feel better, if only for a moment. I’ll never know. Wow. I had a similar experience with my mother but it wasn’t Alzheimer’s. It was CJD, another brain disease. If it’s any comfort, the neurologist told us that “brain dead” isn’t a bad way to go for the victim herself. No pain and rarely any recognition of the problem. Like you, we finally had to make a pull the plug decision. Actually my Dad made it, but I think it was the right one. It’s so hard to see it happen to a parent though. You’re so right. I remember all of us gathered around her when the moment came to end her life. When it came, it came quickly. The last breath. I felt my knees buckle and so many emotions that it hurt to sob, which I did anyway. No one should have to make that decision. It’s awful. Mikalee, the sad thing is how prevalent this disease is. We all know someone affected by it, and no matter what, it is painful to watch when a loved one goes through it. So sorry about your grandmother. Wow. What a powerful post, Monica. And the symbolism: She was packing to see her dead mother. That just shows you sometimes, we know when the end is near. “Everyone else” was my entire family, gathered around Gram in support.